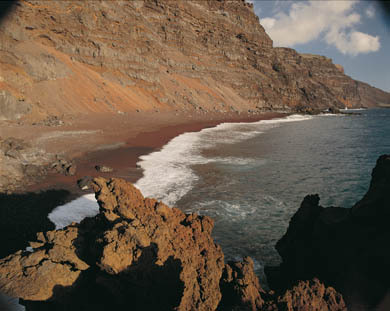 The El Verodal Beach, is located in the municipality of La Frontera, near Orchilla Lighthouse, on the small island of El Hierro. This is a very atypical beach in El Hierro, for many different reasons. First of all this is the widest beach on this island and the only one with natural sand with a reddish tone. Even though this beach might be dangerous for bathing, due to its strong waves and currents, it is very popular maybe because of its wonderful views. When the sea calms down this is a paradisiacal place.